Oil futures and equities have been trading in tandem throughout much of the last few months. Some analysts and strategists see the stock market following oil prices, which serve as a sort of recession barometer. Rising oil prices are converging with other factors to tamp down concerns about a recession, after amplifying growth fears late last year. 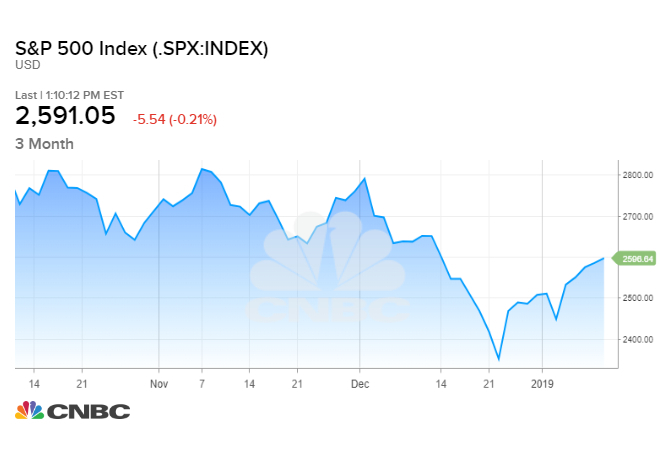 Stocks are taking a cue from volatile oil prices, where traders are looking for signs of a recession and other problems in the market, according to analysts. Crude futures and stocks have been trading in tandem throughout much of the last few months in part because both markets are concerned about the same macro factors: rising U.S. interest rates, the ongoing U.S.-China trade dispute and signs of slowing global economic growth. However, some strategists believe equities are actually following oil prices, which serve as a sort of recession barometer, since economic growth is closely tied to fuel demand. At the end of last year, the collapse in crude futures essentially amplified fears of Federal Reserve rate hikes, trade tensions and the pace of economic growth. "Stocks were far less of a lead indicator and more of a concurrent indicator than they usually are," said Julian Emanuel, head of equities and derivatives strategy at BTIG. "Oil really got caught in the same geopolitical uncertainty downdraft." Emanuel notes that stocks bottomed on Dec. 26 after U.S. crude hit a trough on Dec. 24. Since their intraday lows, benchmark oil prices are up about 22 percent, while the S&P 500 has bounced back about 10 percent. "The price of oil is telling you there isn't going to be a recession. It's firming up. To me that's the feed through loop into equities," Emanuel said. Oil prices are likely to head higher in 2019, in part because Saudi Arabia has backstopped the market on the supply side with significant output cuts, said Francisco Blanch, head of global commodities and derivatives research at Bank of America Merrill Lynch. But there is also now support on the demand side following commentary from Federal Reserve Chairman Jerome Powell that the central bank will be patient with future interest rate increases. "With a shift in Fed policy direction approaching, we see an oil 'demand put' being triggered within the forecasting horizon," Blanch said in a research note Friday. "In other words, we think that the global recession fears priced into oil markets during the Christmas period were overblown and see the Fed acting preemptively to deter a major global economic deceleration." Dan Deming, managing director at KKM Financial, said another oil market-related fear that knocked around stocks has also faded. The collapse in oil prices triggered concerns about high-yield debt defaults in the energy space and the risk of contagion throughout markets. The energy sector, particularly U.S. shale drillers, accounts for a significant portion of outstanding high-yield debt at any given point in time. "It really freaked the market out in '15 for a little while because people thought a lot of these shale producers were going to have to default on their loans," he said. "That scenario re-entered the mindset of a lot of market participants. You saw the high-yield space really spike in December." "Now, it's had a significant snapback and that has helped alleviate some of the concerns as oil bounced and we're now seeing this bounce in the equity markets. I think that's a big reason for the correlation to this point." CNBC's Jim Cramer has also drawn connections between equities and the oil market going back to last fall, based on research by Carley Garner, co-founder of DeCarley Trading. "The bottom line: You can't understand this breakdown in this stock market unless you recognize that we're seeing some spillover from the carnage in the oil futures," he said in November, at the midpoint of a sell-off that saw U.S. crude lose nearly half its value. According to Garner, as oil prices fell, traders were fielding margin calls on their commodity investments, forcing them to sell stocks to cover their crude positions. At the time, Garner warned that the selling in oil, and therefore stocks, could continue for a while due to the large number of bullish bets on crude that had yet to be unwound. 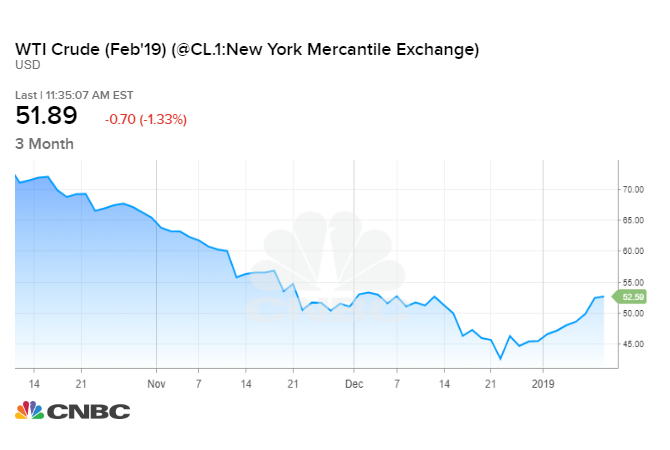 The oil market eventually bottomed in the final week of December, with U.S. crude nearly hitting $42 a barrel and international Brent crude dipping below $50 a barrel. — CNBC's Elizabeth Gurdus contributed to this report.